Our canine guests here at Paradise for Pets get the real summer camp experience. Our dogs are matched up with other pups by age, size, and temperament. Breakfast is served each day at 7:30. The dogs are then taken outside to play from 8:00am-4:30pm each day the weather permits. Our outdoor pens are 30’x45′ on average, and come equipped with sunshades, a shower system, a dog house and all the water your pet cares to drink. At 4:30 (or if it rains, is too cold, too hot, or thunderstorms threaten) the dogs come into the indoor runs to get dinner and some sleep. The indoor runs for dogs are fully heated and air conditioned, come equipped with a large bed and throw rug, and measure 5.5’x30′. Our price includes two meals a day with our food, NutroMax: Chicken and Rice Blend, and all the outdoor exercise your companion can handle. Special feeding and medications can be served at an additional fee. Dogs not comfortable in the group setting can be boarded separately at a slightly higher rate. Our staff promises to give your dog all the attention and affection he or she deserves while maintaining a clean and safe environment for them to vacation in! 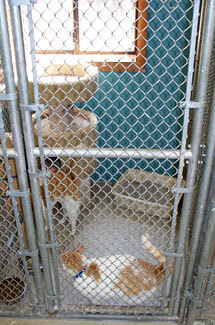 Paradise for Pets has an oasis of calm hidden away for our Feline friends. Cats boarding with us have a personal 4’x4′ pen that is 6′ high. Inside the space the cats have their own litter box, food and water, and cat condo. Several of our pens have window views, so your cat(s) can stay up to date with their bird watching!